We have recently shown that erythropoietin receptor (EPOR) protects cancer cells from tamoxifen (TAM)-induced cell death in the absence of erythropoietin (EPO). In this study, we analyzed the effect of EPOR silencing and EPO treatment on the response to TAM in human ovarian adenocarcinoma cells A2780. We demonstrated that the EPOR siRNA silencing decreases cell proliferation and sensitizes and/or potentiates the anti-proliferative effect of TAM on A2780 cells. 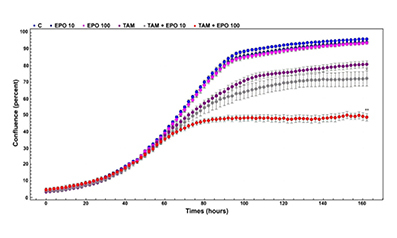 Similarly, the combined effect of EPO and TAM treatment significantly reduced cell proliferation compared to TAM alone. Our in vitro results indicated the need for further investigation of EPO effects on a similar in vivo model.